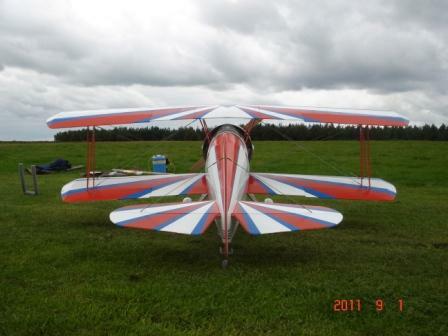 The Aircraft was modified by Harold Krier from a Great lakes special for aerobaticscompetitions in the early 60s. 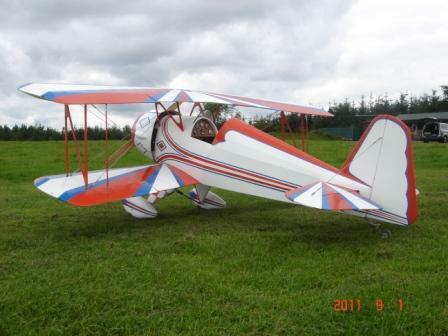 The Great Lakes was a two seat aircraft with poor vertical performance. 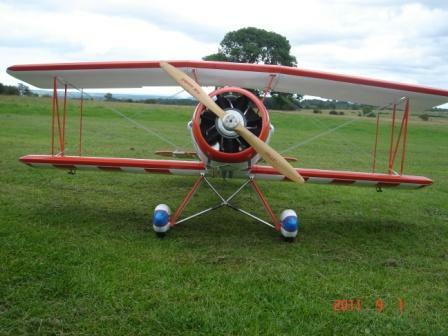 The modified single seat version had a more powerful engine, the wings were of shorter span, and were both swept back , influenced at the time by the bucker jungman. 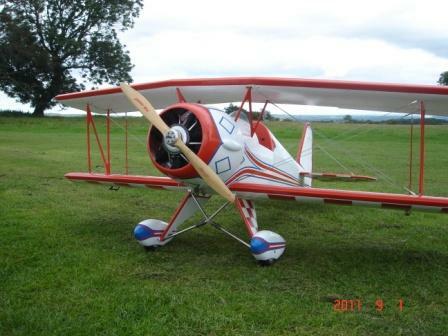 Harold Krier won four world championships in 1960-1964 before the aircraft was outperformed by the new pitts special. 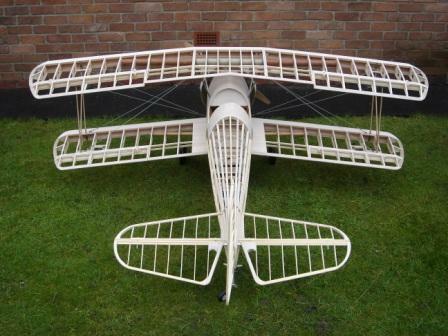 The model was built using the Gorden Whitehead plan, and was scaled up from 1/5 to 1/3 giving a wingspan of 86 inches. Only the outline was used as the model uses frames rather than full formers as used in the 1/5 plan. This would have made the model excessively heavy. 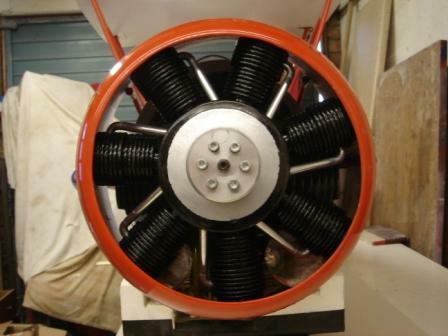 Power is a 3W 120cc twin cylinder petrol engine turning a 30x12 prop. Weight is 39lb. 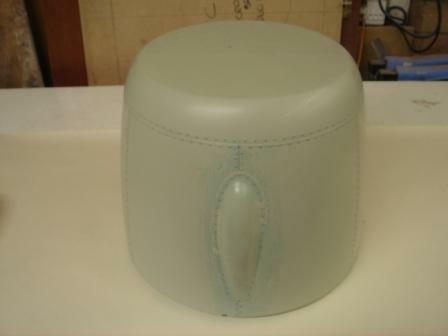 The first part built was the fibreglass moulded cowl. This was made by turning a foam plug, finishing with epoxy and then adding panel line and rivet detail. 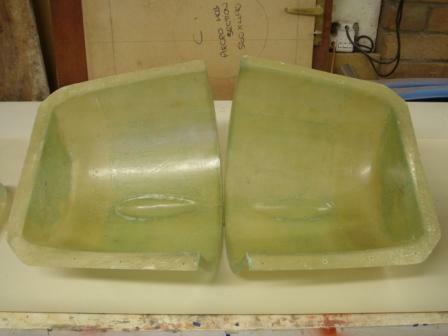 A polyester glass mould was made to produce the finished cowl. The spats were made in the same way. 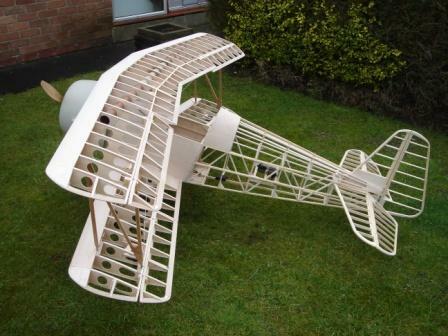 The three piece wings are made of lightply ribs with spruce and Cyprus main spars, and balsa covered. These are joined using wing tubes. Stainless steel fittings were bolted in place for attachment of load bearing 2mm stainless steel flying wires. Wing and tail plane tips were made using ply laminations for strength. 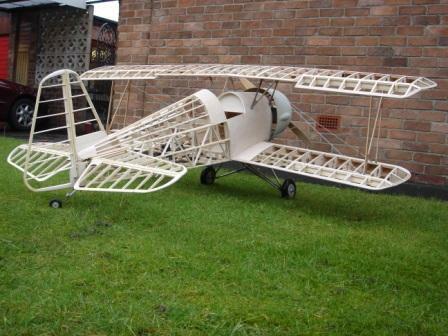 The fuselage was designed with frames and stringers, these being Cyprus and balsa with a ply former for engine mounting. 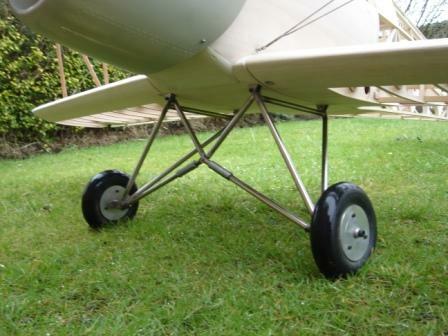 The cabanes and undercarriage was made using 10mm stainless steel tubes , silver soldered together. Cabanes were flattened to an oval section, and plates silver soldered on for attachment to the top wing centre section and fuselage. The lower centre section has brackets mounted on ¼ ply plates which allow the undercarriage ‘A’ frames to hinge, providing springing. The airframe is covered in ceconite. This is full size polyester material in light weight grade normally used for microlites. The material is heat shrink similar to solartex, but has to be applied with dope. Eight square metres of the material was required. The ceconite has to be glued to the airframe using nitrate dope, then two to three coats applied to fill the material. After application of the nitrate dope, a further two to three coats of butyrate dope has to be applied to completely fill the ceconite. This is necessary because butyrate dope will not adhere to the polyester, but has better filling quality. Colour is aircraft quality butyrate dope which is the same as the full size aircraft. In total, over two gallons of dope was required to complete the model. The seven cylinder simulated radial engine is made of blue foam. This was cut oversize with a hole saw, and a mandrel pushed through the centre hole to enable machining. To avoid tearing the foam a dremel was mounted in the cross slide, and by using a grinding wheel the foam was ground to size and the fins machined. 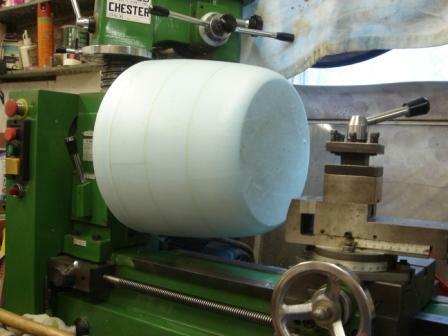 The finished cylinder was then sealed with diluted white glue, then coated with epoxy resin before panting. A fibreglass centre moulding was made into which the seven cylinders were fitted.